Find a Fabulous Selection of Baby Moses Baskets and Gorgeous Moses Basket Bedding. These Portable Baby Beds Are the Perfect Convenience for a New Mom! Baby moses baskets are exactly what they imply - a small woven basket usually lined with pretty fabric. 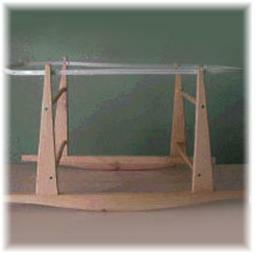 Most have handles for carrying from place to place and some have the added benefit of a hood and a stand. As an added bonus, moses baskets are small enough to be placed in your baby crib to help in the transition from a small baby bed to the real thing - a big deal for your baby! Our Baby Moses Basket Shop! Check out the baby moses basket sections here for the widest selection. Advantages of A Baby Moses Basket. This world is going to seem like a pretty big place to your little one when she first arrives kicking and screaming. She'll be looking to you to give her somewhere warm and secure to rest. Short of mom's arms, which is where she would really like to be, a moses basket is one of the best places you can choose to put her down. You can soothe your baby quickly when she wakes. Getting your toes cold at night is one part of the newborn experience you will want to avoid, and baby needs to know that mommy is right there when she is needed. It's easy to bring baby into your bed for nighttime feeding whether feeding from the breast or the bottle. You will both get more sleep. Baby is more likely to develop a good sleep routine if she is swaddled in a small space, content in the knowledge that mommy is nearby. A secure environment in the early months is the basis for sound, restful sleep later on. You will recuperate from childbirth more quickly if you don't have to keep getting up and down, especially if you have had a c-section. Baby moses baskets are easily moved around the house with you during the day so that you can keep an eye on your sleeping sweetie-pie. Place the basket on a surface above the floor, such as a couch or table. The cold floor is no place for a slumbering newborn. Moses baskets are small enough to place inside full size baby cribs. This is helpful when it comes to easing the transition from the small baby bed to the baby crib. For the first week or two let baby spend the night in your room in a moses basket. Daytime sleeps should be in the moses basket too. Move the basket around the house and have baby sleep near you during the day. Be quick to comfort and attend to your baby when he wakes both at night and during the day. This will build a sense of security in your baby that he will associate with the moses basket. After a few weeks place the moses basket in the crib in the nursery room. Start leaving your baby to sleep there during the day and a few days later at night too. Be sure to use a sound monitor and be quick to attend to your baby's needs. He will gradually begin to associate the environment of his crib with the same security provided by the moses basket. By the time your baby outgrows the basket, he will be ready to sleep in the crib without any anxiety. Security is the basis of a good sleep pattern. A good sleep pattern results in a happy and healthy baby, and a much more lively mommy! Research has shown that babies who sleep in their parents' room for the first year are less likely to succumb to SIDS. Moses baskets are breathable. This is important because it prevents baby from over-heating. A confirmed SIDS risk. Baby moses baskets are fully portable. They can be taken with you wherever you travel. Enjoy your stay with a baby who is calm and relaxed because her two favorite things are nearby - her mom and her basket. 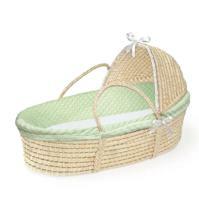 Baby moses baskets are made from neutral wicker materials and are available with a wide variety of soft fabric linings. You won't have any trouble finding one to match your bedroom decor. As with all small baby beds, the main disadvantage of baby moses baskets is that they will only serve as temporary snuggle nests. A moses basket can be used until your little dumpling is around four months old, or rolling over by himself - whichever comes first. As soon as your baby starts to roll there is danger of the basket tipping, and you will have to move your baby to a conventional baby crib in the baby nursery. See my Smart Tip above. Check that the basket has handles long enough to meet in the middle so that you can carry the basket with one hand. You can buy a moses basket stand seperately. This one from ababy.com is a rocking stand - an extra bonus. A stand is useful for keeping your baby's basket off the cold floor. Hoods are great for when you want to take baby outside. You don't want the sun getting in his eyes. On the other hand, you may not want the hood up when baby is inside and it will be easier to lay baby down and pick him up with the hood folded back. Make sure that the retracting mechanism works smoothly - no sticking. Newborn babies have very sensitive skin. Make sure that the fabric in the basket you choose is soft enough not to cause any irritation. This is your first priority. 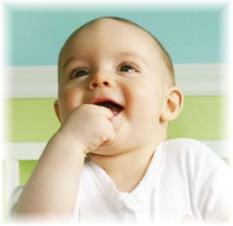 Babies spend 60-70% of their first year in their crib. It's up to you to make sure they sleep safely. It is essential to ensure that the basket you decide on, meets the Consumer Product Safety Commission (CPSC) standards for safety as an absolute minimum. A sturdy bottom for stability. Never lift or move the basket with baby in it. Do you have a favorite small baby bed that you couldn't do without? Let us know and write a review of your favorite small bed for your baby. You will be entered in our current giveaway. Baby moses baskets are a wonderful way to give your baby the comfort and security she deserves during those first few scary months. Please be aware that the baby moses baskets information provided by Creative Baby Nursery Rooms is for the purpose of helping you to decide on the best basket for you. Upon making your choice, it is your responsibility to ensure that your preferred moses basket adheres to the CPSC standards for moses basket, cradle and bassinet safety.